Sunset wedding on the overlook over Big Beach, Makena. Yes, hugs and kisses, romance, sunsets, love, honeymoons and weddings. Hawaii represents all these things as an international romance destination. Granted, XO is a bit gimmicky, but there are not a lot of things that start with the letter X.
Ah, Hawaii, how do I love thee as a symbol of romance? I love thee for the depth and breadth of your sunsets on which to gaze along my fair love's sunburned cheek. I love thee for thy promenade of weddings on the beach, the exhausted conch shell blower barely able to muster a breath after the fourth wedding of the day. I love thee for thy champagne toasts and romantic beaches as couples walk dizzily hand in hand looking for lost car keys in the sand. I love thee for thy beautiful waves that have stolen my honeymoon sunglasses and beach hat from my head as we embraced in the water. You get the picture. I'm being a bit tongue in cheek. Weddings and honeymoons and romance are a major part of Hawaii's tourism culture. Romance is a tricky business though. There are stories of couples who come to Maui for the first time. One variation is that half the couple comes back to Maui with a different partner the following year. The other variation is that next year, the same couple comes back for their honeymoon or wedding. The year after, they come back with a baby. Then there's a gap, and they come back with another baby. Hawaii is a great place to start a family! Some tourists may not even see the outside of their hotel room! Anna Kim Wedding Photography - I'm always blown away by her pics. I can't say the photo below is one of her most romantic, but it's delightful and that phrase in the sign is a classic Maui kind of thing, "Just Maui'd." Mahalo Anna for allowing me to reuse your photo! 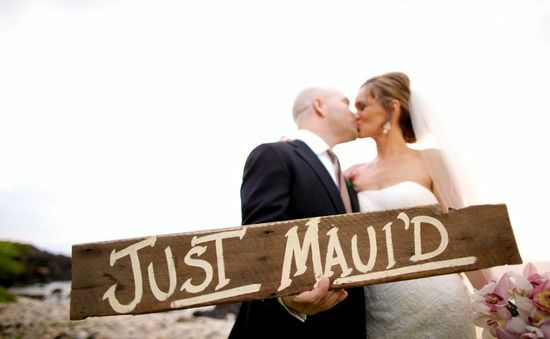 Yes, "Just Mauid" or "Maui'd" is a sign you'll see here. Okay, I loved the JUST MAUID pun. That's splendid. I like the variation where they come back to get married, then with each new child. But then, I'm a romantic at heart. When it comes to X, you have to be a little creative so I thought this was great. Hawaii seems like the perfect romantic, exotic destination. LOL! Great, and mahalo for tweeting! Your poem is hilarious. hahahahaha. Yup, I think of Hawaii as one of those beautiful and romantic places. I guess many people think beaches and palm trees when they think of the island. I have to agree with you, Hawaii is such a romantic place, especially for love.